Dinner, gala, cocktail-evening, seminar, christmas parties, product launch, weddings or something completely different. Kellohalli offers unbeliveable flexibilility, unique atmosphere and most of your needs already in the venue. Kellohalli main hall is over 400m2 and 10 meters high and it is easily customized for different events. Combined with Flavour Studio and other smaller areas it is a 700m2 entity which can be easily split into different uses. Atmosphere with a lot of possibilities limited only by your imagination. We make it easy for you to make up the venue look like yours. Combined with Flavour Studio Kellohalli is a place were people can mingle, prepare food & drinks, sit in for a dinner, enjoy presentations and bands - all in one place. How about a more inspiring and relaxed atmosphere for your seminar / workshop? Kellohalli suits that purpose very well. We have microphones ready in the house, a presentation screen and a 2 fixed patios, which serve as a stage. One of the easiest locations. Drive in front and bring in your gear. Big, spacey and industrial. All necessary elements in place and the flow of operations as well. Headroom is a small private room as a part of Kellohalli, which can be reserved for small workshops / private lunches or dinners, or as a bar. It seats 12-40 people and is equipped with a plasma screen. The room has authentic yellow brick walls and it is otherwise dark with its own calming atmosphere. Workshops for about 20 people and lunch and dinner for 30-40 people depending on the set-up. 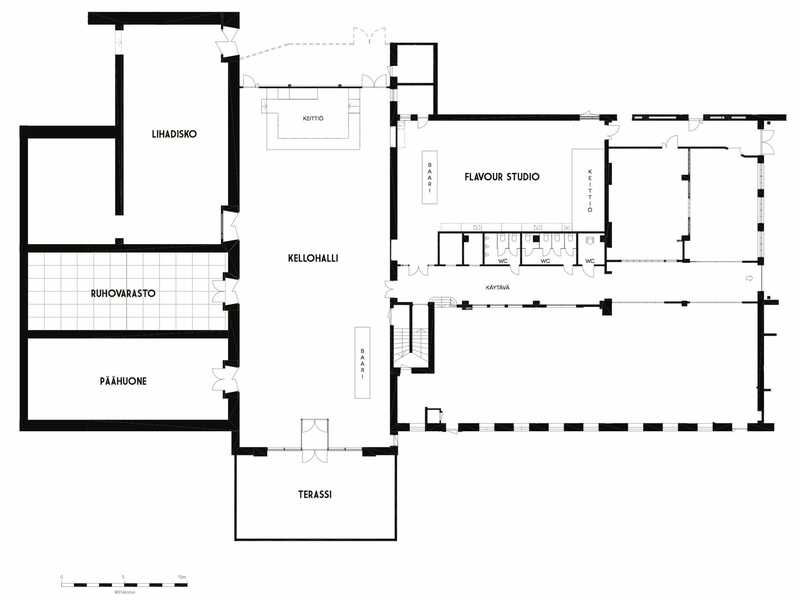 Here you can see the floor plan of Kellohalli including the Headroom (the hall down left), Kellohalli main hall (the hall in the centre), Lihadisko (the hall up left) and Flavour Studio (the hall up right). You can book all of these venues together or separately. Standing events for about 350 about and sit down events for about 200 people. We have extensive experience in the field and are happy to help you with your event.